This week (August 1st through 7th) is National Farmers Market Week, a great time to celebrate our farmers and great produce. I'm reposting this flavorful recipe, which uses summer's best: Lovely zucchini, new potatoes, complex fresh herbs, and makes for a nice presentation in no time. As you’ll see, this dish relies on fresh herbs for its explosion of flavor. The fresh herbs also pack lots of nutrition—they’re a powerhouse of phytochemicals and antioxidants, and a great addition to your healthy diet. •	1 cup of mixed fresh herbs—tarragon, parsley, chives, oregano, thyme and basil are good options; be creative, but use more of the mild herbs, and less of the more potent oregano and thyme. •	Heat the oven to 350 degrees F.
•	Prepare the sauce. If you have a food processor, pulse all ingredients to a course grind. Otherwise, chip all dry ingredients as finely as you can, and mix with the olive oil and spices. •	Mix all ingredients, taste the zucchini and correct the seasoning. •	Brush some olive oil on an oven-safe baking or gratin dish, and transfer the zucchini potato mix. •	Transfer to the oven, and bake for 60-80 minutes, until potatoes are well-softened. If the top darkens too much, and the potatoes aren’t yet soft, cover with tin foil and bake some more. They had been playing in the back yard and while looking for the lacrosse ball, they lifted the sled they left under the magnolia tree a week ago (what they were doing with a sled in mid-summer is another topic). 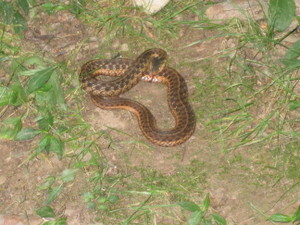 And there was the snake, with its beautiful checkerboard patterns, sticking out its tongue at me. I quickly took these pictures and the snake left quietly. 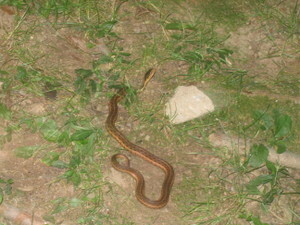 I’ve only lived in this area for about 9 years, and this was the first snake I saw in our own garden. We get plenty of rabbits, deer and foxes, and we’re happy with our animal visitors -- even when they eat up the garden -- but my kids weren’t happy with the snake. Is fear of snakes inborn? A fear we learn from everything we read, including the very beginning of the Bible? So very few people are happy to see a snake and many snakes wind up getting killed for no good reason. My kids and I took this opportunity nature had given us to learn more. Pennsylvania has only three types of venomenous snakes, and we found that an easy method of telling the difference between a poisonous versus a non-poisonous snake is to look at the shape of the pupil. Non-poisonous snakes all have a round pupil (like us people) whereas all poisonous snakes have a vertical elliptical (cat-like) pupil. Alas, I didn’t pay enough attention to the snake's pupil, as the tongue and skin were so much more interesting (and in my picture the snake has “red-eye” syndrome). I sent the pictures to my very clever friends, and got my answer. The first to identify the snake as an Eastern garter snake was my artist friend (in my personal experience, artists are acute observers of nature, as nature is the major inspiration of art), followed by my kids’ head of school -- a self attested snake lover, who has a few snakes as pets -- who emailed me that snakes are a good sign of a well-balanced eco-system. I’m grateful to my garden, for giving me this line of connection to nature and living animals. Although I refer to the garden as “my garden” I know I don’t really own it, but only share it with other living things. So much happens in my little piece of nature that I can’t control and I’ve stopped trying to pretend I can. We haven’t had even one strawberry this year, although we have three plants. As soon as they ripen, a mysterious caller takes them away, and since we admit that we have so much food, and the animals have so little, we are quite pleased to donate the strawberry. As to the herbs, I’m happy to say that those are not shared by our wildlife. They leave the herbs well alone for the butterflies to visit. Somehow, it gives me comfort to know that I, the humble gardener, am just a small part of what’s going on in this ecosystem, and that life bursts forth with all its force, despite my efforts to tame it. Foodies and gardeners were ecstatic to hear that Michelle Obama started an organic edible garden on the south lawn of the White House last week. Maria Shriver, California’s first lady, also announced that she plans to establish an edible garden at Capitol Park in Sacramento. Millions of Americans have started private and community plots with the intent of growing their own food. Seed sales are up, and it seems like everyone’s ready to dig in the dirt. Hooray! I’m pretty sure that every gardener is enriched by working the garden, and we can all learn a lot about good food by growing some of it ourselves. Both the act of gardening and that of being in a garden have a significant impact on people’s well being. What is it about the garden that so many people find restorative and healing? •	Gardening is great way to teach children about plant food and healthy nutrition. I think it’s quite obvious that with familiarity and positive experiences fondness grows. If kids have fun in the vegetable patch, and see their seeds grow into beautiful fresh vegetables, they’d be more likely to eat them. Since few American kids consume enough fruits and veggies gardening projects can address this important nutrition objective. •	Gardening can be great exercise. It can be moderate and even strenuous exercise; this really depends on how you garden and what you choose to do. I’ve written before about my inability to get excited about the gym, and that I’d much rather get work done than wait for time to pass when on a treadmill. If you’re like me, gardening’s the exercise for you. I can edge my beds and dig for hours, and not believe it’s already lunch time, but I can’t take my eyes off the stationary bike’s timer and I swear something’s wrong with it. Whether it’s light pruning or heavy digging, gardening sure beats sitting down. Gardening is physical activity—and it’s especially beneficial for older people. •	Gardening will get you into composting. Any organic gardener knows that the secret to great crops is great soil, and great soil comes from great compost. It sometimes seems to me that some of my gardening friends are more excited by the leftover peels and skins—the stuff that goes in the compost pile—than in food itself. If you grow vegetables, you’ll surely want to recycle your kitchen scraps and send less trash to the landfill, and that’s definitely a good thing. Even though gardening is good for body and mind, I have a few common sense words of caution: be careful with the sun, be extra careful if you use any power tools, don’t garden with bare feet (or much bare skin altogether; who’d do that, you wonder? I’m not telling! ), and stay clear of the poison ivy. •	The easiest growing edibles are culinary herbs. They ask for very little, thrive on neglect, and give great satisfaction. You can start harvesting practically from day one, and they’ll enrich your meals with their complex flavors while adding healthy benefits. •	A garden has a mind of its own about what it wants to grow. Left alone, mine (which has good soil and gets plenty of rain) is sure not to grow any veggies and will be overtaken by weeds. Weeding is therefore the bread and butter of gardening; it’s where I spend most of my time. •	You can either fight the multitude of animals wanting a share of your bounty, or give up without a fight. I opt for the latter. I’m grateful to be able to have rabbits, deer and squirrels in my backyard—they make me happy, they were here before me, and I’m not sure I would have won the fight anyway, as they’re so very clever about getting food. So, I plant a lot to make sure there’s enough for everybody. •	Growing an edible garden sure did deepen my respect for the farmers who grow my food. Growing quality organic food requires knowledge, experience and lots of hard work. I’m very grateful that I can depend of professional growers to supply plenty of delicious produce, because to be quite honest—it’s not that easy to grow your food. If you have little experience your “seasons” are way too short, and not that plentiful. Most of the time it seems you’re practicing delayed gratification just waiting for the veggies to ripen. Waiting and weeding. •	For apartment dwellers interested in joining the edible garden movement a few suggestions: If you have a sunny window you can grow herbs in pots. You can also look into joining a community garden; besides all the benefits mentioned above you'll enjoy gardening in a social setting, and beatifying your neighborhood. I’d love to hear about your garden experiences and insights. Wishing you a great growing season.